Luxury experiences and romantic nights under a starry sky. 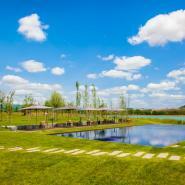 A unique Alentejo landscape defined by the vine, a big lake and the medieval castle of Montemor that can be seen in the distance, surrounds the sober luxury of the L'AND Vineyards Resort. This is an exclusive retreat with an identity based on winemaking and in a discrete, exceptional service that guarantees an enriching stay. Here, the bold architecture stands out, based on the contemporary reinterpretation of the Arabian and Roman tradition of patio houses, with a strong connection between the interior and the exterior. Slate and wood are central in the decoration of the spaces, as well as the pieces of art, fabrics and exclusive furniture. The suites are intimate and romantic, offering private patios and terraces with a fireplace, a view of the lake and direct access to the swimming pool. The Sky View suites, besides including a heated plunge pool in the patio, enable the observation of the starry sky with the surprising opening of the room's ceiling. In the L'AND restaurant, the chef reinvents the Alentejo traditions combining them with the Oriental and Mediterranean cuisine, in a journey of cultures and flavors accompanied by wines produced locally. You may get to know these wines better and deepen your enological culture, participating in the tastings and courses carried out in the wine cellar by the resident enologist. The SPA, with its exclusive Winetherapy rituals, massages and beauty treatments based on grapes and natural products, provides another series of unique experiences of serenity and pleasure, not to be missed in the L'AND Vineyards Resort. - Water, coffee and tea in the Suite. - iPad in the Suite. - Use of the SPA (sauna and indoor swimming pool). - 20% Discount in the SPA. - Aperitif at the restaurant. From Lisbon take the A2 using the 25 de Abril bridge in direction of Setúbal and Algarve. Take exit 7 and follow onto the A6 in the direction of Évora / Espanha, taking exit 3 towards the N114, in the direction of Montemor-o-Novo. On the first roundabout turn right in direction of Vendas Novas following on the N4 until you find the signs to the hotel. Continue for 400 meters turn right after the bridge. The entrance to the hotel is 500 meters away. "We admire the architecture, avant-garde, but in perfect harmony and integration with the environment; we like the concept and in particular the Sky View suites, the comfort and amenities available. (…) This resort is on par with the best in the world and deserves strong recommendation to everyone searching for an experience of superior level in hospitality." "What I liked? The hotel's framework in Alentejo's landscape, with a view to Montemor-o-Novo castle. The hotel's design and the suite and decoration. The gourmet meals, especially the tasting menu, and wines. The comfort of the bed and sliding roof with a view to the sky, in the morning, and to the stars, at night. The overflowing swimming pool with comfortable lounge chairs. The pleasant, professional, and young employees. The massage in the SPA. The surrounding landscape with vines. I recommend it all!" "I loved the sky suite, the view of the starry sky is a marvelous experience. (...) The restaurant is really an unmissable experience for those who appreciate the art of eating well, gourmet, simple and very tasty. The breakfast is marvelous, gourmet and personalized. The service is all very pleasant, the welcoming massage to the SPA makes you want to relax even more. (...) Highly recommendable!" "The contemporary minimalism of good architectural taste and hotel decoration, the beauty of the surrounding landscape, the quality of the service, the discrete luxury of the environment. It is the ideal hotel to spend the perfect romantic weekend!"